Three pieces from the Reflect series are headed to a healthcare facility on the west coast. These shimmering urban views of familiar rhythms and repetitions will work well in any lighting conditions. The three pieces are integrated with a consistent palette of opaque and iridized sheet glass. Viewers are invited to consider familiar—and often overlooked—moments of urban beauty from our streetscapes. Art pieces from my series Reflect were selected for waiting areas in an urban hospital. Mixed media work with glass offers viewers a bold and unexpected visual experience. Shimmering cut glass set against matte cement creates a high contrast and dynamic piece that captures the vibrancy and energy of the streetscape. Reflect is inspired by urban beauty. 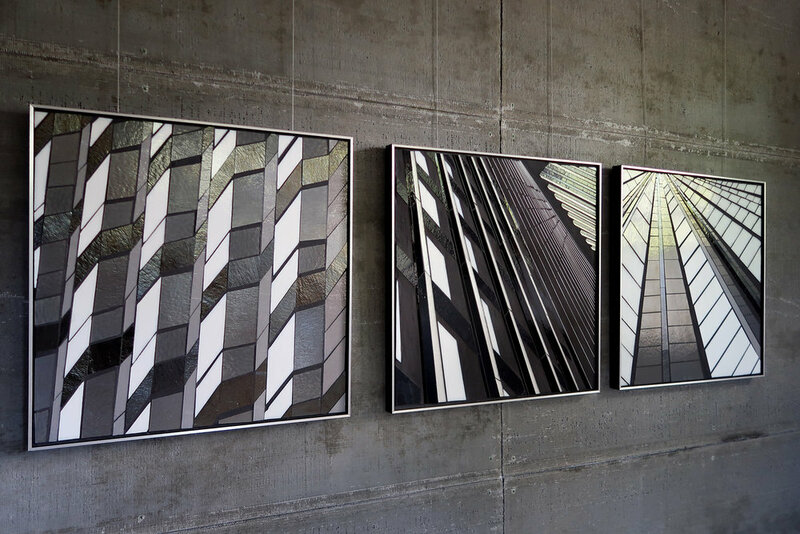 The work explores the repetitive forms of our cityscapes, fluidity of light and reflection, and how unusual perspectives and distorted geometries take on the qualities of the natural. Viewers are invited take another look at familiar moments of urban rhythm and beauty. Collaboration with J.D. Thompson and Associates all occurred remotely. Art consultant Jane Thompson is familiar with my portfolio from previous collaboration. Jane selected pieces from the Reflect series that worked best in the designated public space. A cohesive palette of shimmering whites, blacks and grays unifies the hanging. Iridized glass is particularly effective in catching ambient light and adds a further dimension to the work. Work shipped framed and ready to hang.